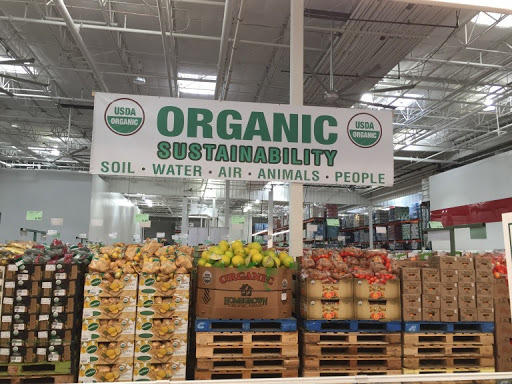 We see the words “certified organic,” and, for some, it’s a total mystery. What does it mean to be certified? Who certifies that it’s organic? Lida Farm’s been certified organic for the last four years, so let me shed a little light. Last week we had our organic inspection, which is a significant part to the certification process. In the spring I submit all planned inputs to our certification agency from any fertilizers to the brand of bleach we use to clean the sinks (it’s from Fleet Farm, for the record). All inputs have to meet standards set in the 90’s by USDA, so materials need to be non-synthetic. Also seeds need to be certified organic themselves, if available. Our certification agency, OCIA, reviews all these plans and the ingredients to all these inputs lets us know if they meet the USDA standards. Then, when the organic inspector comes, he wants to see evidence that these were the inputs we used and he’s on the lookout for any chemical use on farm. Our inspector this year was a guy named Eli. After a quick walk around the farm to look at the fields, our packing shed where we store crops, and the buffers between us and conventional fields, we spend a few hours sitting at my kitchen table, looking over seed packets, field history records, and the documents I submitted in the spring. Eli has me do an audit of five different crops to see if I can explain the whole chain from seed to sale to a customer – we do five because last year we 228 different varieties. I show in my records when I planted the variety, where on the farm it was planted, which inputs were used on that field, and where and when I sold that crop variety. Four acres seems small until you start tracking every bed in this way…. Anyway, I think we passed. Last year NOAA declared 2016 the hottest year on record – the third consecutive annual heat record. That means 2014 was the hottest year on record before 2015, only to have the record broken again just the next year. The jury is still out on 2017. As somebody who does vegetable production for part of my living, I pay close attention to weather and the overall change in weather trends, i.e., climate. I have observed a couple major trends since I started on this path over 15 years ago. One, the shoulder seasons have shifted. Summer’s keep extending into fall and springs have typically had large stretches heat. Two, storm events are certainly more intense. I don’t I need to explain this to anybody who lives in the area and you’ve certainly heard me point this out before. I bring up climate today simply because the future of agriculture has been on my mind. I’ve been wondering if my children viably take on this place 30 years from now. Considering that modern agriculture developed over two millennia in a very stable climate, such a drastic change over the next few decades could prove untenable. Sure technology can give us tools to adapt, however, such deep rooted influences on crops such as insect and disease migrations will most certainly prove a challenge. All told, these climate shifts make me nervous at best. Green Cabbage: Most received a half cabbage simply because they were too big to fit into the box. Buttercup Squash: Seems like most people’s favorite type. Please store all winter squash in a dry, sunny location…that’s where it does best. 2-3 Delicata Squash: The yellow ones with a green strip. Thyme: Small bunch with red band. A Couple Small Corn: This came out of this last sad patch of corn. I figured we’re far enough away from the main corn season that you’d appreciate even a couple stray ears. When you think of farm tools, what comes to mind? Hand hoes? Planters? Maybe red or green tractors? Yes, we use all those things and more at Lida Farm to raise a vegetable crop. Many farm tools and implements have a set season such as the transplanter, which gets its use in May and June and just patiently awaits next year for another round of action. 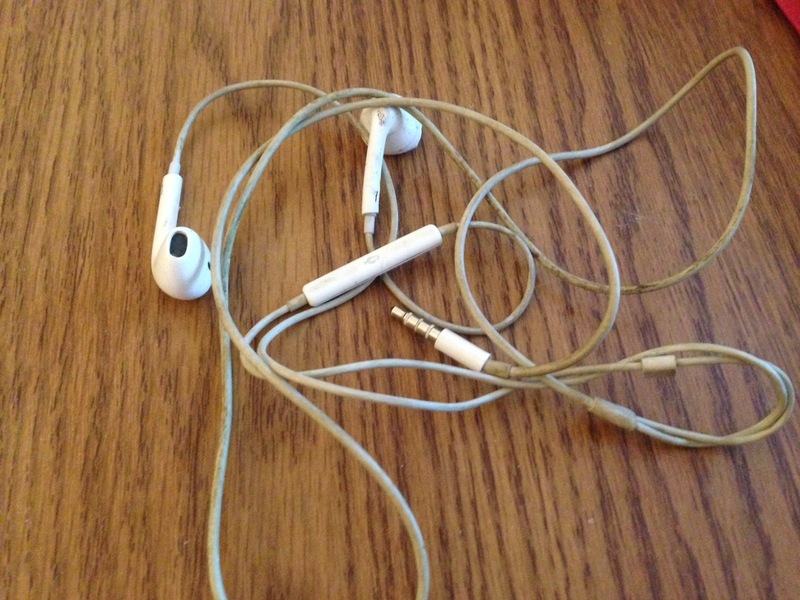 However, one tool is used daily and is probably the most useful tool is one you would never think about: the iPod. Manual laborers the world over use music to keep the day moving along. It’s fairly universal. I’ve heard radios blasting on Manhatten construction sites and in Tijuana auto body shops alike. Some workers like my dad like the constant background annoyance of AM news. My dad might be on vacation for two weeks and you could still probably hear Sid Hartman on the radio in the garage. Myself, I change up my music based on the needs of the day. Many a morning when I go out to do some easy chores, I listen to something chill and etherial like Gregory Alan Isakov or Jason Isbell (whom I saw this week at Bluestem – thanks, Kelsey Wulf, for watching kids for our annual date night). General work throughout the day calls for some Grateful Dead and Ryan Adams numbers, but I have times when I really need some juice to get things done. In these instances-picture me pulling in 3,000 onions by myself or quickly cutting greens in the last 10 minutes before we have to rush off to the farmers market-I bring out some adrenaline-inducing noise: fast-paced electro-pop like Sylvan Esso, MGMT, and LCD Soundsystem or 3-chord rock n’ roll like Faces and The Rolling Stones. So, we ought to thank the soil and sunshine for good produce, but every now and then we should also give a nod to role Mick Jagger played in getting in the crop. Cherry Tomatoes: Very good for fresh eating! Cippolini Onion: This is my favorite onion..has lots of flavor. It’s the flat one. Black Spanish Radishes: You would peel the black outside of these radishes but use however you like any radish. It’s cool looking. A Couple Summer Turnips: You have two types, Scarlet Queet and Harurai (white). These are great fresh with just a little salt or salt plus a vinegar. You can also add to a salad to give it some crunch. Packing boxes for members on Tuesday, it was remarkable how red the box was. 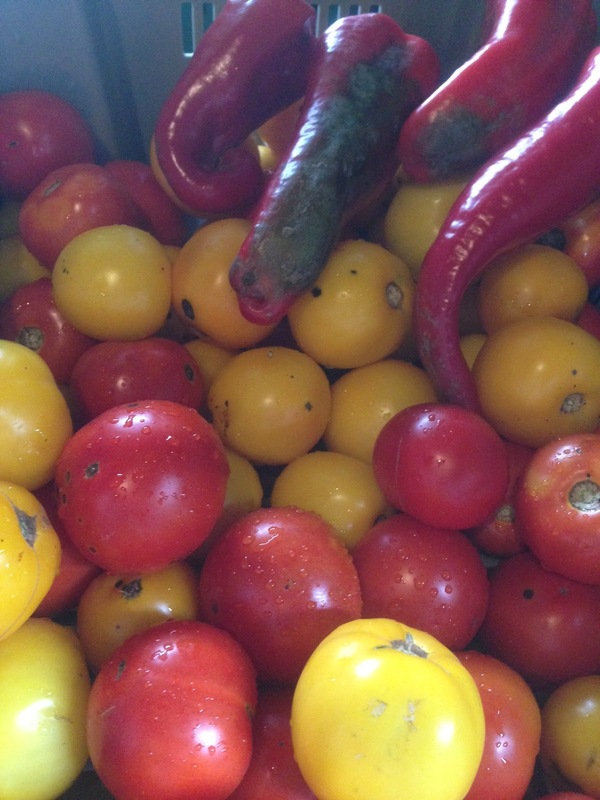 The Italia peppers, the tomatoes, the cherry tomatoes, the radishes…. Reflecting on the season, produce comes in waves of color as we move from the solid greens of spring to the yellows and purples in high season eggplant, corn, and Islander peppers. And, certainly, we still have before us the wonder and vibrant oranges of fall, maybe a brilliant red of fall salad mix and the golden mix of winter squash. The kaleidoscope of a produce season is nothing short of a miracle, that even in this harsh climate of the Upper Midwest, we have such diversity in our eating. With this potential in our gardens, it’s all the more depressing that the typical Midwestern diet consists of many shades of tan and brown. I’ve been selling and talking produce for a long time now and it never ceases to amaze me that fresh produce for MANY people is some kind of special, once or twice a year kind of thing. Lots of people buy sweet corn twice a year and then go back to their slumber of fried foods and frozen dinners…maybe they’ll indulge in a stuffed acorn squash or buttercup in the fall. Maybe I shouldn’t be surprised; it is the Midwest after all and starches and meat rule. But I’m not one to give up. I have seen plenty of good changes in the diversity of diet we ought to celebrate. Thirteen years ago I literally gave away kale and heirloom tomatoes at our farmers market and today people often request them. My outlandish references to kimchi and Caprese salad don’t elicit as many blank stares. I consider this progress. Watermelons: I grow a mix of red, yellow, and orange varieties. It’s the luck of the draw for what you received. Fresh Oregano or Marjoram: Random little bunch in the box. Fresh shallot(s): A shallot look like a small red onion and you’d use the same as you would a red onion. Cherry Tomatoes: Hurrah, we finally got these in the box! That took a while. Eggplant: Most got a Japenese style, but some received these cute little variety called ‘Fairy Tale’ and some traditional Italian style. Don’t worry, it’s just an issue of shape and they will all taste like eggplant. Looking at this box and thinking about what might still be in your refrigerator, please consider making ratatouille. It’s kind of the french way to use up a bunch of veggies in season this time of year. I’m getting lazy with typing recipes, so below is a youtube of this French guy walking through a recipe – please substitute things, it’ll turn out. For example, you could use the sweet onion or fresh shallots instead of the red he suggests.